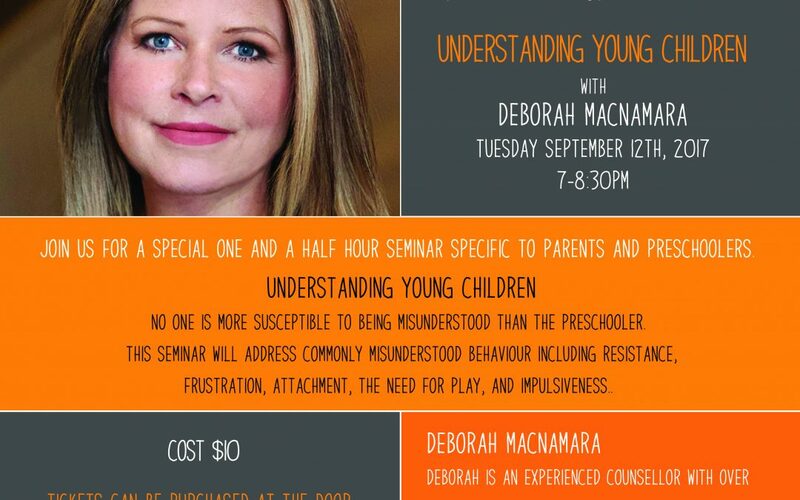 Happy Corner is pleased to announce the next instalment in our Parent Education Series, kicking off our 2017/2018 school year with Deborah MacNamara! Deborah is a dynamic teacher and experienced counsellor with over 20 years experience in educational and mental health settings. She is passionate in taking developmental science and making it applicable to everyday life in the home and classroom. She is the author of the best selling book, “Rest, Play, Grow: Making Sense of Preschoolers (or anyone who acts like one)“ and provides counselling and educational services to parents and professionals based on the relational-developmental approach of Dr. Gordon Neufeld. She is on Faculty at the Neufeld Institute and presents on all of the Neufeld material. No one is more susceptible to being misunderstood than the preschooler. Unlike infants and toddlers, preschoolers actually bear a resemblance to grown-ups and therefore fool us into thinking that they are much more like us than they really are. Projecting our psychology onto them is a typical mistake. This presentation will address commonly misunderstood preschooler behaviour including resistance, frustration, attachment, the need for play, and impulsiveness. Tickets are $10 (includes refreshments) and can be purchased via eventbrite or at the door on the evening of the event. Hope to see you there! Happy Corner is now a Parent Involvement Preschool (PIP)!